We all know what the right click context menu is in Windows and how it works. At it’s best, the menu can be a hugely valuable resource to get certain tasks accomplished more quickly than digging through programs and their settings to do the same thing. But what if this menu is getting in your way for some reason and you want to disable it? Perhaps you or your children are playing games in a browser and keep accidentally right clicking when you don’t want to, or you just don’t want somebody inexperienced to have access to the quick options of renaming or deleting something on the desktop in case they delete something they shouldn’t. Disabling the right click of the mouse might sound like a simple thing, but you can’t just press a button in Windows to turn it off without a piece of 3rd party software or going deeper into the system settings. Here’s a selection of 5 solutions to enable you to turn off the right click of the mouse so the context menu isn’t called and can’t be triggered by accident. There’s a registry entry you can add to disable the mouse right click. This only works on the desktop and Explorer though and doesn’t affect any programs, you can also still right click on the task bar and control the tray programs via right click. This obviously isn’t the best solution around but it does provide a small level of desktop protection over accidentally doing something via the Explorer context menu. 2. 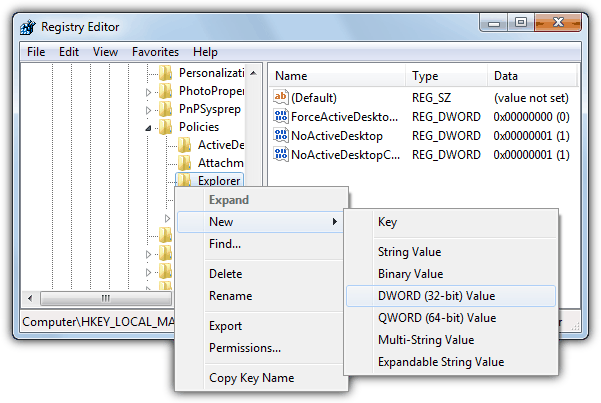 Right click on the Explorer key and select New -> DWORD Value. 3. 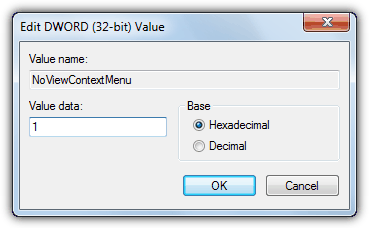 Give it the name NoViewContextMenu and click OK. Then double click the name and set the value data as 1. Press OK. To set it back again simply set this value back to 0 or right click on the NoViewContextMenu entry and delete it. You will need to log off or reboot for any of these changes to take effect. For ease of use and to save you going into the registry we have created these keys in easy to run .reg files which simply need to be double clicked on. 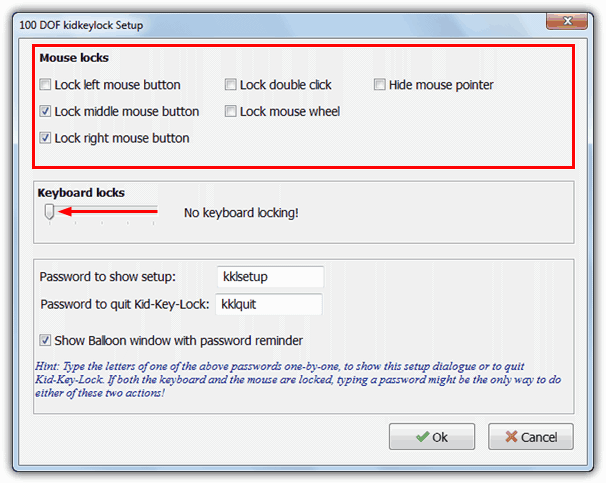 Kid Key Lock has been mentioned before in our article about Restricting or Disabling Keyboard and Mouse Buttons, but can be setup to only disable the right click function in Windows. Of course if you want, other mouse buttons such as left click, middle click, double click and the scroll wheel can be disabled also. Simply open the program and tick the mouse button boxes you wish to disable and press OK. The program’s little padlock tray icon will flash whenever a locked button is pressed and you can quickly change the locks by left clicking on the tray icon and going to the Locks sub menu. It would have been more useful if the password option could be used to lock the setup options screen in case you want to stop the user enabling the mouse buttons again, but that option is only of benefit when completely locking the keyboard. If you don’t want any keyboard restrictions make sure to turn the keyboard locks slider in options all the way to the left. There is a portable version and also an ad supported installer version available. That just tells the script to intercept the right mouse button and then do nothing with it. Although the right click is disabled, you can still Shift right click in Windows or to exit the script. With a bit more creativity and know-how you can obviously add other things to the script such as disabling the tray icon, adding a password to turn it on and off etc. If you want to try it out, here’s a compiled script with just that 1 line. 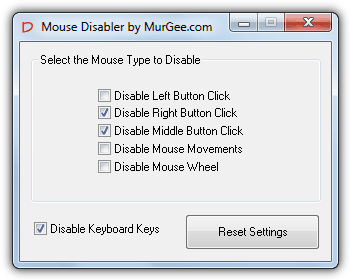 Mouse Disabler is like a slightly simpler version of Kid Key Lock and just shows the tick box options to disable the left, right and double clicks with a few others you might find useful such as mouse movements and the scroll wheel. The Disable Keyboard Keys option will turn off the most basic keyboard input. Actions are applied as soon as you tick the box and the program doesn’t close to the tray or disappear into the background, but instead simply minimizes to a task bar icon. Even though Mouse Disabler needs installing you can copy its executable and Helper.dll from program files to make it portable. The odd thing is the uninstaller application is 10 times bigger than the utility itself! 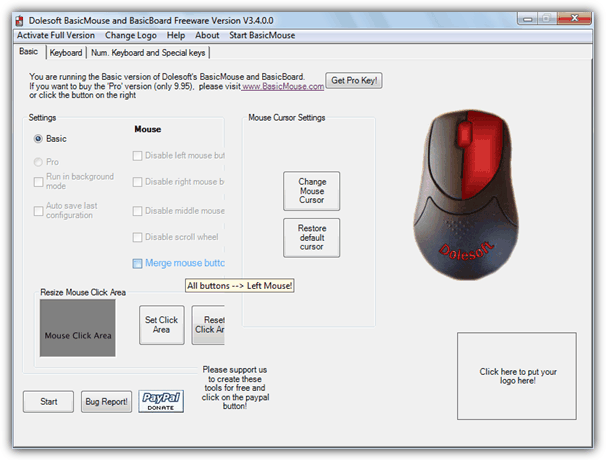 This is a shareware utility called BasicMouse and BasicBoard, which used to be called BabyMouse, that allows you to easily restrict several functions of the computer mouse and keyboard. The right mouse button can be disabled, all buttons can be set to send left-clicks, mouse clicks can be restricted to a particular area of the screen etc. Recent versions restrict the program to a 30 day trial which costs $7.95 to activate, but older versions only limit some of the features to 5 minutes use and disabling the right click is free to use. Simply run this older program and it will sit in the system tray for as long as you like disabling the mouse right click without needing to touch any of the time limited functions. The downside is it also disables the scroll wheel as well which you might not want. Nº 3. Using an AutoHotKey script. He gives a link to download the script and try it but then he puts a password in it and don’t show it. Is this stupid??? P.S. I disabled the right-click button by jamming a paper clip into the small space between the button’s up and down positions. That low-tech solution seems to be working well so far. It may work loose eventually, but it’s pretty firmly in there at the moment, and it’s jammed into the front of the mouse where my hand never is. Even if the paper clip does pop out occasionally, it will be easy to jam it back in, and that sure beats having to click on the screen to get rid of unwanted menus that keep popping up all the time, because I have to have my hand on the mouse and if I do that, it’s very hard to completely avoid the right button continually. I’ve put up with the right click button for a very long time, and it was always a real pain. I wish I’d thought of this solution right away. Benjamin Franklin would probably have realized almost immediately what he should do to get rid of the annoyance, but he was always thinking and I’m not. Somebody less lazy and more entrepreneurial than myself should produce and sell a mouse with a little switch that can quickly be moved left or right, to enable or disable the right-click button. The switch should be in front of the mouse, out of the plane of where person puts his fingers naturally when using a mouse, or one would be flipping the switch back and forth accidentally which would be no help at all. Such a mouse might sell like hot cakes. I’d buy one if it wasn’t exorbitantly priced. It would be easier than sticking a paper clip into the right=clip gap when I want to play “24.7 spades”, or look through lists without unexpectedly highlighting everything and its brother, or try work with anything where the right click button triggers “helpful” popup menus all the time as I move my mouse around. Mouse Disabler is a very dangerous program for amateurs. I installed it then, due to inattention, I checked “disable left mouse” instead of “disable right mouse”. After that, I couldn’t do anything because the left mouse button is needed for almost everything. After playing around for half an hour, including rebooting in SAFE mode (which didn’t help), I finally got to the program location and deleted the program. Now my computer works again.. I’d like to tell you how I finally managed to delete the program from my computer, but I don’t remember how I did it. There’s no way I’m going near this program again with a ten-foot pole though. That mistake is too easy to make and too hard to rectify. I still want to disable my right mouse button, because it keeps popping up menus and highlighting stuff, which is a royal pain in the you-know what. It’s very hard – impossible really – to avoid touching it all the time. I don’t use the right mouse button for anything at all, so if I could just glue it in place that would almost be an acceptable solution for me. I’ll look around some more for something not as dangerous, though. I disabled the right click with your script, now how do I enable it again? There are separate downloads to disable and re-enable in the article. Very very nice website with important working tips. Ilike it, I Love it……..
just make it, works for me. Thanks! This was the only solution I found online that worked! Thanks a lot for this great post. I work at a computer/tech store and we have a number of computers availble for customers to access our website to check for products. However, due to recent events I ended up having to set up the computers so that they were a bit more secure. I managed to set it up rather well, but this rightclick context menu editor just might be helpful if they do get out of the kiosk setup. this is really a valuable information for me. thanks for proving this valuable information. i was facing the problems caused by using the right click by any amateur user of computer.